Dickerson on "CBS This Morning"
CBS News anchor John Dickerson has been named co-host of "CBS This Morning," joining Gayle King and Norah O'Donnell on the network's critically acclaimed and award-winning broadcast. It was announced Tuesday by David Rhodes, president of CBS News. Dickerson, begins anchoring Jan. 10, 2018, and will be based in New York. Dickerson will transition out of his post at "Face the Nation," where he took the anchor's chair in June 2015. He steered the show to some of its largest audience levels of the past three decades. His extensive digital footprint includes multiple podcasts, among them "Whistlestop," which chronicles great moments in the nation's history, and the "Slate Political Gabfest" a leading political podcast. Dickerson is also the author of two books and a contributor for the Atlantic. "John's impressive track record and strong all-around journalism extends our commitment to real news coverage every morning at CBS News," Rhodes said. "Gayle and Norah continue to show tremendous leadership on our morning broadcast each day. Colleagues, newsmakers, and peers all appreciate the depth and context John Dickerson brings to every discussion of the day's events — together with his co-hosts he will project our best values on every broadcast." "Few people possess John's intellect, curiosity and journalistic chops," said Ryan Kadro, executive producer of "CBS This Morning." "He's the perfect complement to Gayle and Norah and will help us continue the momentum 'CBS This Morning' achieved over the last six years." "On the campaign trail I've collected compliments about 'CBS This Morning's' commitment to the news for years now," Dickerson said. "Every time I've been on the show I haven't wanted the conversation with Norah and Gayle to end when my segment does. Now it doesn't have to." "Today is our sixth anniversary. Can't think of better way to celebrate and kick off our next chapter," King said. "This is a new beginning with an old friend," O'Donnell said. "I've worked alongside John for almost 20 years and this is a great way to continue our mission of putting the news back in the morning." Dickerson joined CBS News in April 2009 as an analyst and contributor to all of the network's broadcasts and platforms. He served as the network's political director for six years and was named moderator of "Face the Nation" in June 2015. During the 2016 presidential campaign, he moderated CBS News' two presidential debates. As host of "Face the Nation," he also interviewed each of the major candidates multiple times. Dickerson has been a reporter in Washington since 1995, covering the White House, Congress and economics. Most recently he was Slate Magazine's chief political correspondent, winning the Ford Prize for Distinguished Reporting on the Presidency. A 2010 long-form series on risk profiled current Secretary of Defense James Mattis. Before Slate, Dickerson covered politics for 12 years for Time magazine. During his last four years, he was the magazine's White House correspondent, covering the presidency of George W. Bush. With Dickerson at the helm, "Face the Nation" delivered its second highest audience level in the last three decades during the fourth quarter of 2017, only behind the election fueled fourth quarter of 2016. Currently, "Face the Nation" is the No. 1 Sunday public affairs program. 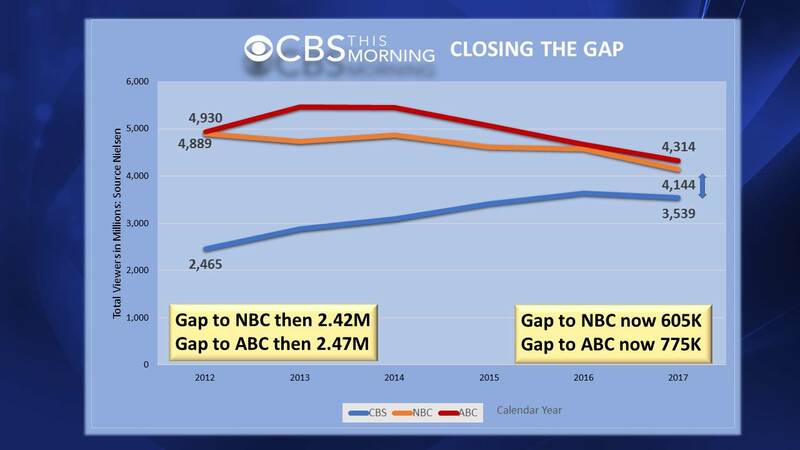 Since launching on Jan. 9, 2012, "CBS This Morning" has increased CBS' audience in the time period by 44 percent -- or 1.01 million viewers -- while NBC's "Today" lost 15 percent of its total audience and ABC's "Good Morning America" has plunged 12 percent. "CBS This Morning" is in its closest competitive position with "Today" in at least three decades and in nearly two decades. Television year-to-date, "CBS This Morning" is delivering CBS its second highest morning audience in three decades, surpassed only by 2016's election influenced performance. "CBS This Morning" has earned a prestigious Peabody Award, a Polk Award, three News & Documentary Emmys, three Daytime Emmys and the 2017 Edward R. Murrow Award for Best Newscast. The broadcast was also honored with an Alfred I. duPont-Columbia Award as part of CBS News division-wide coverage of the shootings at Sandy Hook Elementary School in Newtown, Connecticut.